Temecula is Southern California’s wine region. But Temecula doesn’t necessarily have a reputation for producing the best wine. Since Temecula is an easy hour drive north of San Diego, I am always looking for those special Temecula wineries that defy the bad reputation and surprise with their excellent wine. I found one of those surprises in Danza del Sol Winery. 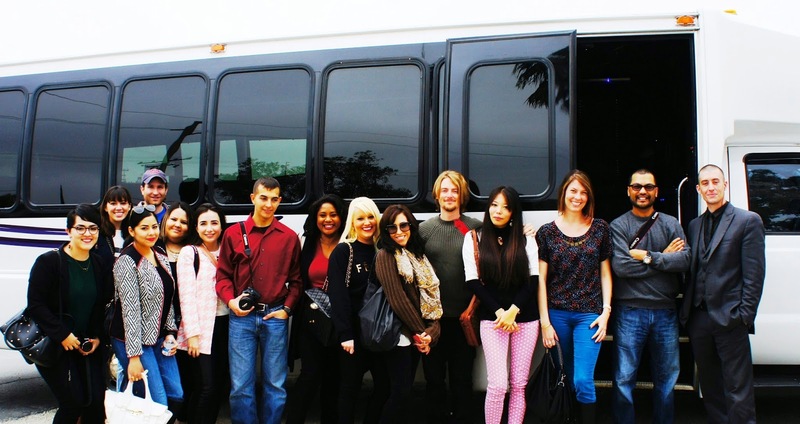 I previously joined a San Diego limo brewery tour with Aall In Limo & Party Bus, so I was thrilled when Aall In Limo & Party Bus asked me to be their guest again, this time to test out the newest addition to their fleet, the limo bus. We drove in style and comfort to Temecula in the spacious and plush limo bus. Our day of wine tasting appropriately started with a bottle of sparkling wine from one of the Temecula wineries in the limo while we drove to our first stop, Danza del Sol Winery. The roomy interior of our Aall In Limo & Party Bus limo bus ride. Danza del Sol is the fifth oldest winery in Temecula. Previously Filsinger Vineyards and Winery founded in 1978, the winery was later purchased in 2010 by the current owner, Robert Olson. The oldest vines on the property are Sauvignon Blanc planted in 1972. This is also where the first Gewürztraminer grapes were planted in Southern California. The winery’s other signature grapes are Orange Muscat and Syrah. Danza del Sol is a 35 acre estate vineyard, meaning all the wine is grown, crushed, fermented, bottled, and aged on the premises. Because Danza del Sol is an estate vineyard and produces a relatively small number of cases, their wine can only be obtained at the winery or through the wine club. Danza del Sol Winery kindly hosted a tour of their winery in addition to our wine tastings so we could learn more about the origins of the wine. We started our tour outside with a view of the vines. The vines were not very picturesque in February as bud break occurs in March when everything starts to turn green again. It was a foggy morning, which illustrated why Temecula is a good grape growing region. Laura Burnham, the tasting room manager, explained it is actually this mist and fog that makes Temecula such a thriving wine growing region. Temecula is only about 20 miles inland from the ocean. The fog comes in from the west, hits the mountains in the east, and cascades down into the valley. The heat in the valley causes the grapes to create more sugars, which later turn into alcohol, which is why Temecula wines are stronger than wines from other regions. We entered the tank farm where fermentation occurs and wine is stored. Danza del Sol’s wines are fermented in stainless steel, which helps enhance the aromatic profiles. Laura gave us a taste of their 2013 Tempranillo, which had completed the fermentation process but had not yet been aged. Tasting a new wine prior to aging was a fun new experience for me. The 2013 Tempranillo was bright purple with a very fruity, grapey taste and a prominent tannin finish, yet it was surprisingly drinkable. Tasting Danza del Sol's 2013 Tempranillo before aging straight from the tank. We then tasted the aged 2011 Tempranillo so we could taste the difference the aging process makes. The 2011 Tempranillo was a darker garnet with a nice fruity aroma and a more mellow taste with less tannin. Laura explained tannin allows wine to age well and mellows with aging. Tasting Danza del Sol's 2011 Tempranillo in the tank farm. After completing our tour of the winery we entered the tasting room to sample more of the wines, starting with four of Danza del Sol’s white wines. The 2011 Sauvignon Blanc is fresh, light, and crisp with a somewhat grassy aroma. The 2011 Viognier has a strong green apple aroma and a crisp flavor. The 2011 Roussanne is an award winner with a very buttery feel. The 2011 Sinfonia, another award winner, is a blend of Viognier, Roussanne, and Danza del Sol’s signature Orange Muscat with a citrus taste and a sweet but fresh finish. We also sampled four of Danza del Sol’s red wines. The 2010 Grenache is a light-bodied red which tastes best slightly chilled and actually has an unusual aroma of root beer, though we couldn’t put our finger on what it was until reading the notes. The 2010 Mourvèdre is a great wine for Thanksgiving with cranberry aromas and a spicy clove and nutmeg finish. The 2011 Barbera is a more rustic red with a deep fruit flavor. The 2011 Trilogy is a Meritage blend with a silky finish. We ended our tastings with Danza del Sol’s sweeter wines. The 2012 Tres Rosé is another award winning blend of Cinsaut, Zinfandel, and Sangiovese. The Rosé is sweet with a pronounced strawberry flavor. The 2012 Gewürztraminer is an award winner which is sweet but not too sweet. The 2012 Sabrosa, a late harvest Sauvignon Blanc made from the old estate vines, is a sweet after-dinner wine, but is not syrupy. The Espumosa is Danza del Sol’s semi-sweet sparkling wine with a crisp melon flavor. I am hard-pressed to visit a winery and not bring any bottles home with me, so I purchased some of our favorites, the Sinfonia, Mourvèdre, Barbera, and Sabrosa. I even brought a bottle of the Sinfonia to a gathering that evening, and it was a hit with all. Danza del Sol’s wine is both exceptional in flavor and very affordable, with most bottles ranging from $20 to $30 without a wine club discount. If you are planning a wine tasting trip to Temecula, be sure to include a visit to Danza del Sol Winery. In addition to wine tasting, you can join a guided tour of the winery. If planning a wine tasting trip with family and friends, book Aall In Limo & Party Bus’ limo bus, which comfortably seats up to 20 passengers. The commute will fly by, and of course there is the added benefit of having a designated driver while you sip champagne and reminisce about all the great Temecula wines you discovered. How many bloggers can you fit into one limo bus? We actually had plenty of room for more.